Traditional Italian biscotti are what we Italians called cantucci or, to give them their full name, Biscotti di Prato: they come, in fact, from Prato in Tuscany but they’ve been adopted in the whole Tuscany under the name of cantucci or cantuccini. Outside of Italy, they’re called biscotti. These dry biscuits are known to be tasty, crisp and excellent if dipped in sweet wine (classic Cantucci + Vin Santo is an unmissable traditional combination). 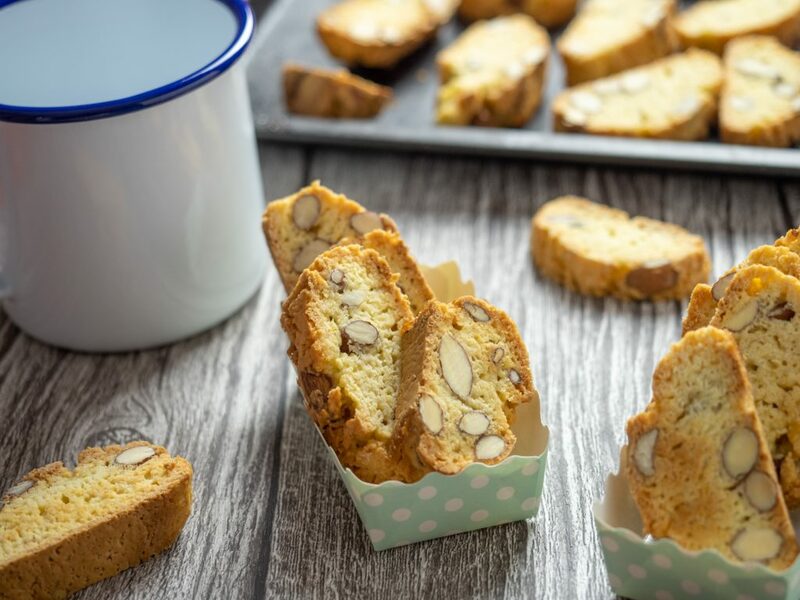 The traditional recipe of biscotti is simple and quick enough but hides a pitfall: these biscotti are in fact cooked twice and this means that if you exceed the oven temperature the result could lead to hard and therefore inedible biscuits. 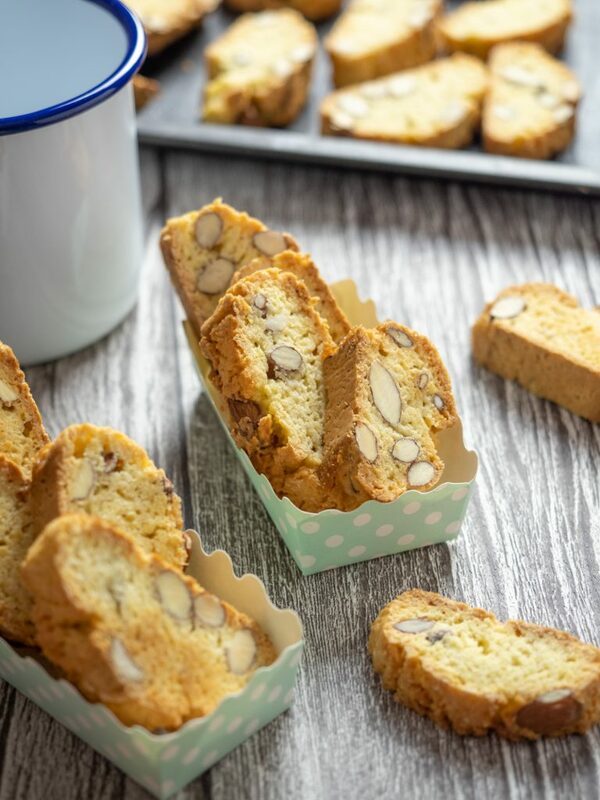 The key element for good Italian biscotti are almonds: tradition says you should use only unpeeled almonds because they give a special flavor to the cookies but to sweeten them naturally you can also use peeled almonds, possibly adding a few more than required. Once prepared, the traditional Italian biscotti are kept very well up to 30 days if stored in a tin box and can also be kept in a paper bag; plastic bags are likely to soften them and make them inedible. The cantucci require the use of ammonia for sweets that allows the dough to stabilize without growing too much; it can be replaced with baking powder in equal quantities. The traditional recipe does not ask for the use of butter that can still be used to make these cookies more fragrant. Remove from the oven, let the logs cool for a few minutes then cut the logs into slices of a maximum thickness of 1.5 cm, while still warm. Lay each slice back on the baking sheet and bake for another 15 minutes. Remove from the oven and allow to cool in the same tray. There is also a different version of these traditional biscuits: the soft cantucci. They are prepared simply avoiding the double cooking in the oven so that once the log is out of the oven, just slice it and leave the biscotti to cool on the pan still warm. The heat of the pan will allow finishing cooking in a natural way and the cantucci will not dry out and they will, therefore, remain soft. Obviously the traditional cantucci foresee the use of almonds but they can be personalized using dried fruit, chocolate chips, candied fruit and so on and so forth. Some add a little bit of liqueur wine to the mixture to make it more fragrant: it is an extra ingredient that can be inserted to give the biscotti a different and specific taste. Another concession to the traditional recipe is a drop of limoncello in the dough, for cantuccini who know about the sea and the sun. Although there is evidence of the existence of cantucci in the Florence area around the end of 1600, it was only during the mid-1800s that the recipe was formalized. To do so was the pastry chef from Prato Antonio Mattei who took the original recipe that included flour, sugar and egg white revisiting it and creating the corner we know today. The recipe was appreciated immediately, to the point that was presented during the Universal Exhibition in Paris in 1867, obtaining great recognition. In 2016 the cantucci have obtained the recognition of IGP Protected Geographical Indication, which arrived in 2016 and includes the entire administrative territory of the Tuscany region. This means that today to prepare the cookies according to the specification, for example for the sale, you have to follow some precise rules; each biscuit must not weigh less than 15 g, the thickness must not exceed 2.8 cm and the almonds must be at least 20% per kilogram. Cantucci and vin santo is a classic and winning combination: two Tuscan products par excellence, with opposite characteristics that come together to create a unique combination. In fact, by its nature, the corner is never overly sweet and its hard consistency makes it the perfect companion of dessert wine that instead is naturally sweet obtained from the Trebbiano and Malvasia grapes. We do not know exactly how the coupling was born but presumably stems from the fact that both products are Tuscan and the combination is probably born spontaneously. If you can’t find vin santo you can eat your cantucci with a good Marsala wine.